Accused Blogger/Reporter Poker Cheat Tekintamgac Now Suing Partouche Poker Tour! Alleged poker cheat Ali Tekintamgac has decided to sue the Partouche Poker Tour over his dismissal from the tournament last year. 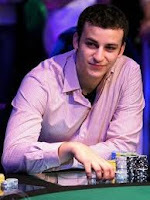 Tekintamgac was removed from the final table of the tournament when a review of the video tape showed he was using an elaborate scheme to see other players’ hole cards. Tekintamgac used a few strategically placed “bloggers” and “reporters” to relay the strength of Tekintamgac’s opponent’s cards through hand signals. After reviewing the video tapes the Partouche Poker Tour decided to disqualify Tekintamgac prior to the final table of the tournament; which had a €1.3 million first-prize. At the time the Partouche Poker Tour turned over the evidence to French authorities, who were unable to detect the cheating going on from the videos –the scheme is quite elaborate, and without the help of professional casino security would probably be overlooked by typical law enforcement officers. My take: This is just another case of a guilty poker cheat taking advantage of the fact that it can't be proved he cheated...Heck, he'll probably sue me too! Was UB.com Huge Online Poker Cheating Scandal Only the Tip of the Iceberg? According to UB.com insider Travis Makar, yes! In an interview he said that the cheating uncovered by the players of the TwoPlusTwo poker forum was only the "tip of the iceberg." He claimed as well that the same owners running the show during the Russ Hamilton-engineered supercheat-scam are still profiting from the customers' rake. He went on to say that apart from the superuser scandal, disgruntled UB employees hacked into online player accounts and that these players were victims to thefts of funds in their accounts. My take: Of course it's the tip of the iceberg! In fact, it's a bigger tip of an iceberg than the iceberg that hit the Titanic was! More Online Poker Cheating Mess For Sorel Mizzi! Last Year's Bluff Magazine online poker player of the year is again being accused of cheating at poker--just one week after his Full Tilt online poker account was reinstated. He had been banned from Full Tilt for two and a half years for a series of online poker cheating violations including multi-accounting. This time Mizzi is accused of cheating 2010 World Series of Poker Main Event runner-up John Racener at Chinese Poker during the PokerStars Caribbean Adventure. The latest in Mizzi's cheating swirl came to light on the TwoPlusTwo poker forum. Member Shaun Deeb posted the following, claiming it is what Racener said happened. "So sorel and John during PCA were doing lots of gambling towards the end of the trip sorel says lets play chinese and says we should also play with a joker. They also did some weird scoring when whoever won most pts/hands every 10 hands the winner gets 5k, sorel had tried to bump up the stakes a few times as well to might higher. So they are rotating the deal and the dealer gets the 14th card in 1 of their hands. Racener has played a ton of live poker so he tends to know procedure and what to look for. He notices sorels shuffling is leaving the 2 bottom cards in place they haven’t moved from the deck. As he starts to deal he notices the first card he deals himself is the bottom card of the deck. He keeps watching sorel and once he’s done dealing john says hes going take the hand with 14 cards in it sorel goes into a tantrum saying it’s his hand his deal. John says I know what you were doing picks up the 14 card pile and shows the bottom card which is the joker. He tells sorel he’s not paying him whatever amount hes down 5-20k and that he’s a scumbag etc." Deeb also wrote that Mizzi blamed a death in his family as well as prescription medication for what happened. Deeb claims that Mizzi said, "I dont really know what to say; he says that I dealt myself a joker from the bottom of the deck when I didn't. People have done it before to me and they’ll do it again. Seems like every two months I have to defend myself against some sort of accusation with no proof and I'm really sick of it. I've been accused of just about everything, and am pretty sure if someone said that I was responsible for the 9/11 attacks, a certain percentage of people reading it would beleive that. The reality of it is: if you post these accusations on TwoPlusTwo the majority of the people will believe you over me. You can say anything about me. I'm wide open and completely vulnerable to being accused of anything shady and having people believe it." My take: Well, it really is hard to believe Mizzi because of his poker cheat history, however, I want to point out that a lot of these posters on TwoPlusTwo are assholes looking to fry anyone they get their keyboards on. If these poker cheating allegations are true, Mizzi is really a compulsive cheater, having waited just a matter of days after his Full Tilt ban was lifted to cheat again. The two Koreans who belonged to an international baccarat cheat team and who boldly used an old-fashioned poker hold-out cheating device now face a possible 20-year federal prison sentence after pleading guilty to one count of conspiracy to commit wire fraud and grand theft from a Native American casino. Wookyung Kim, 34, and Young Su Gy, 60, beat Foxwoods for some $700,000 before that casino's inept surveillance department finally caught on. It was later discovered that the pair belonged to a baccarat cheat team that had victimized Atlantic City casinos for amounts believed to be close to half a million bucks. The Koreans used the hold-out device to hide cards they removed from the baccarat game and then switch them back into the game when they needed to improve their hands. The scam took place between September and November 2010 on the Macau-style midi-baccarat game. My take: These guys will probably go down with the same tune that the Trans did for their Tran Organization baccarat scam, meaning sentences in the five-to-seven-year range. But what is this crap with the wire fraud charge? Seems like the Feds charge everyone with wire fraud regardless of what the crime was.